HUGE 2 STORY HOME PERFECT FOR INVESTORS ! CLOSE TO EATERIES, BELLE ISLE RECREATIONAL FACILITES, AND MORE. HOME IS BEING SOLD AS IS. SELLER IS AGENT. The details on 2499 Baldwin Street: This house located in Lower East Detroit, Detroit, MI 48214 is currently for sale for $59,999. 2499 Baldwin Street is a 1,495 square foot house with 3 beds and 1.1 baths that has been on Estately for 6 days. 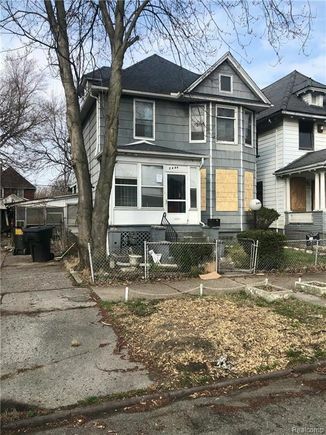 2499 Baldwin Street is in the Lower East Detroit neighborhood of Detroit and has a WalkScore® of 43, making it car-dependent. This house is in the attendance area of Garvey Academy, Martin Luther King Jr. Senior High School, Bunche Preparatory Academy, Southeastern High School Of Technology And Law, Spain Elementary Middle School, Detroit School Of Arts, Cass Technical High School, Ellington Conservatory Of Music And Art At Beckham Academy, Douglass Academy For Young Men, and Detroit International Academy For Young Women.